The Marvellous Markets of London. Whether you’re an avid foodie, a collector of precious salvaged antiquities, a lover of all things art, a fashionista, or even a flower fanatic, the epically varied markets of London have you covered. Of course, the many streets and boroughs of The Big Smoke offer such a vast number of street markets that I would be here for an age if I were to name them all. So, with that in mind, I have chosen a select few that I feel best represents what the merchants of London have to entice you. You can find Brick Lane Market nestled amongst London’s up-and-coming East End, with it being just a stone’s throw away from the uber-hipster Shoreditch, and a short 10-minute walk from Liverpool Street’s Old Spitalfields Market. Although the groovy vintage stores and trendy food houses are open throughout the week, Brick Lane most vividly comes alive Friday through Sunday (particularly on Sundays) when the market stalls are open. The Vintage (Up) Market is an underground collection of vintage, retro and vinyl stalls which boasts some of what are, in my opinion, some of London’s finest curated second-hand fashion pieces. From audacious fancy dress to vintage designers, you can be sure to find all the answers to your wardrobe’s retro desires at the Vintage (Up) Market – and you’ll have a groovy time while you shop. It’s lairy and it’s loud, but fantastically so. As you wander down Brick Lane, your senses will be assaulted with incredible street art, sweet beats and exotic smells; the last of which leads me to my next port of call: food. Brick Lane is not short of options for tasty treats, as, with an extensive network of undercover food markets, you will most definitely find something to tempt your fancy. From Moroccan falafels to Thai, from savoury and sweet crepes to cereal (check out the Cereal Killer Café, also found in Camden), Brick Lane has all the food that you could possibly want. One of my favourite destinations for a particularly indulgent treat is Dark Sugars, who have two shops along Brick Lane, and rightfully so – their chocolate truffles are DIVINE, as are their melted hot chocolates. If it’s culture you’re after, Brick Lane caters for that as well – they’ve got plenty of art galleries dotted around (see The Brick Lane Gallery and Gallery S O), as well as numerous street art pieces and curated stores. It’s alternative and groovy, and it most definitely appeals to the hipster in us all. If it’s something fresh that you’re after, then Southwark’s Borough Market or the Columbia Road Flower Market will definitely fit the bill. Borough Market is open from 10am each day (excluding Sunday) selling everything from Argentinian street food to your weekly groceries. 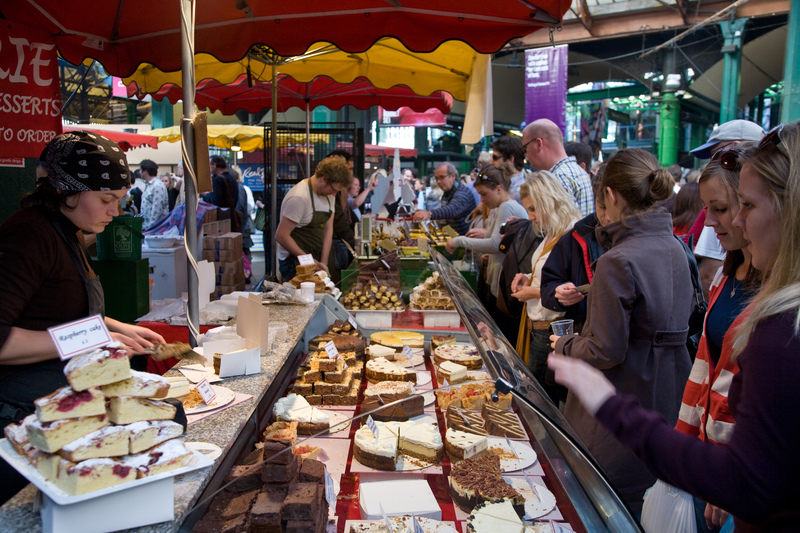 Over 100 traders set up daily to offer an array of heavenly flavours: gourmet meats and cheeses, truffle mushrooms, unusual teas, patisseries, and goat’s milk ice cream – just to name a few. My favourite stall for street food is the Big V London, who sell the most delish vegan burgers; although having said that, my preferred dish from their menu is their plant-based boxes. One of the great things about buying your groceries from a market is that their fruit and veg is often free of pesticides and preservatives. As a result, if you visit the markets around 4.30pm as they’re packing up, you’re likely to come across fab deals, which means that you can get great produce for really reasonable prices. One merchant sells three avocados for £1, and another offers five fresh figs for £2 – amazing deals that us students can’t afford to pass up! Columbia Road Flower Market is arguably the sweetest smelling street market in London, which, come rain or shine, will entice you with gorgeously colourful flowers and exquisite houseplants every Sunday. Just a 12-minute walk from Bethnal Green tube station (Central Line), Columbia Road comes alive each week with performers, tea rooms, and rows and rows of sellers from who you can buy beautiful blossoms for small price tags. But greenery is not all that Columbia Road Flower Market has to offer; as you wander the neighbouring streets, you will come across little boutiques and stalls selling jewellery, clothing, trinkets and many other delights. 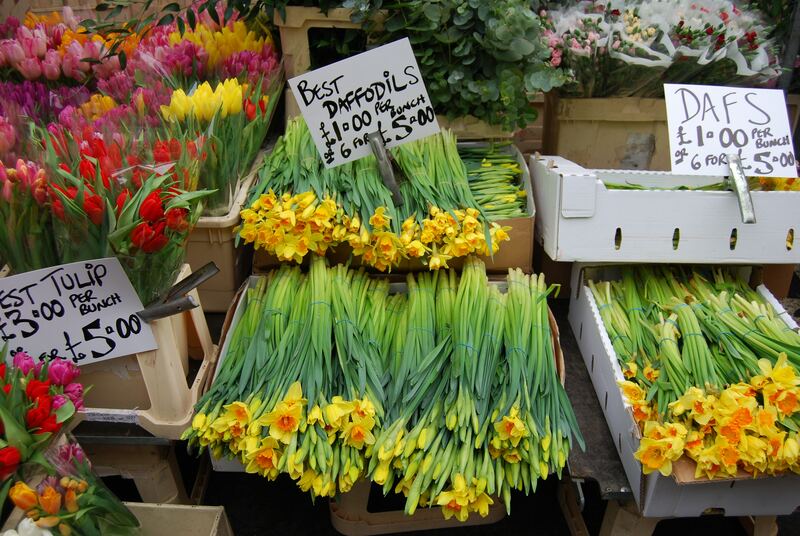 My favourite time of year to visit Columbia Road Flower Market is early Autumn when the mornings are crisp, yet sunny. Amble the road while cradling a bunch of dahlias in hand on the way to The Royal Oak for a pint on the pavement, sounds like a perfect Sunday morning to me. And last, but by no means least, is Maltby Street Market – a small scale, well-kept secret that can be found on the Rope Walk in Bermondsey. This little gem holds a special place in my heart as it is my local; and being located just a short minute’s walk from my house, I frequent this collection of delicious delights often. And so, I’d like to think myself somewhat of an expert, or at least someone who’s recommendation bears some weight. Rope Walk is entirely pedestrianised and is blessed each Saturday AND Sunday with all kinds of gourmet tasty treats ranging from cheese (Cheese Truck) to gelato, from waffles (Waffle On) to gyoza combinations (Gyoza Guys). I can guarantee that you’ll find something utterly divine. Housed within the arches under the railway line are bakeries, Little Bird Gin, oyster restaurants and a bar that sells the most scrumptious sangria. One of the many reasons that I love Maltby Street Market (aside from the fact that it is conveniently on my doorstep) is the incredible sense of community that it fosters. Because of its modest size, it harbours a great sense of warmth, unlike the experience you may have at a larger scale market such as Camden. Bag a table under the flags at Comptoir Gourmand (my favourite bakery) with an Americano and patisserie on a Saturday alongside your best mate to kick off your weekend. And there you have it, a few recommendations of my favourite markets in and around London to fill your next couple of weekends. Other equally groovy markets not mentioned above are Camden Market (for alternative clothing, furniture, delicious food, and a healthy dose of the ‘edgy’), Old Spitalfields Market (a covered market full of tasty grub and independent stalls), and the infamous Notting Hill’s Portobello Road Market (for stylish antiques and collectibles from over 1,000 different stalls). ← Recipe of the Week: Deep Fried Oreos.